"Live Long Enough to Live Forever." That's a bold declaration - perhaps even the indictment - of the book by Dr. Terry Grossman and Ray Kurzweil. Readers will no doubt recognize Kurzweil's name from his famous text, The age of Spiritual Machines, and Dr. Grossman is the founder and director of the Grossman Wellness Center (formally the Frontier Medical Institute) and is widely considered an expert on nutrition and anti-aging therapies. The text was a joint effort between the two scholars, and addresses numerous concerns regarding both our spiritual and our physical aging process as human beings. The text gives an overview int the radical, life-changing modalities of modern science addressing anti-aging and life extension - an emerging field that some consider to be on the fringe of Western medicine. The authors, however, intend to change all that. In this compendium of health data, introductory scientific definitions, and even preventive tips, Kurzweil and Grossman provide both layman and advanced students with a definitive guide on how to practically apply every day life extension techniques to enhance current daily living and achieve greater longevity. The reader may be skeptical, perhaps even overly cautious with the text at first. With only a glance, its pages can seem full of daunting details and definitions of such things as RNA and protein blockers, starch inhibitors and fibrinogen, just to name a few. A closer evaluation, however, will reveal sections that provide tips on how to make smart, healthy eating choices in younger and middle years to prepare and perhaps even prevent the entropy associated with the cellular decay of old age. Some parts of the text actually give lists of foods and/or supplements that might be beneficial for those looking to enhance their current health, as well as prepare for the future. The book also gives an overview about the importance of spiritual health and its essential role in the preparation for longevity. One section delineates an array of precise techniques for meditation, and describes the role that meditation can play in the alignment of the spiritual and the physical. The authors maintain that spiritual health is every bit as essential for balanced living and longevity as is proper nutrition and exercise. This book is a must read for anyone interested in the study of anti-aging and life extension, but should not be undertaken lightly. Its pages are chock full of important information, lists and techniques that - when applied with care - can no doubt render the desired benefits of longevity. Furthermore, every reader concerned with health and wellness overall should undertake this read - it is indeed a fantastic voyage. 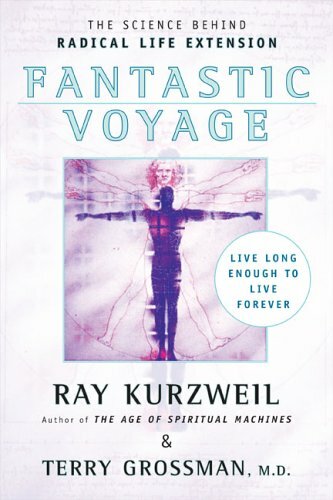 "Fantastic Voyage - Live Long Enough to Live Forever"